Official 2014 Latest Microsoft 70-410 Exam Dump Free Download(181-190)! 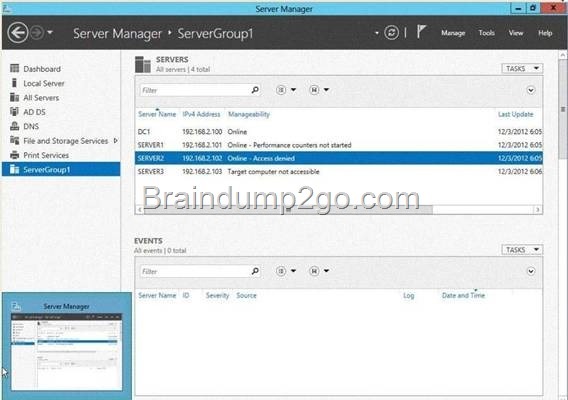 Your network contains two servers named Server1 and Server2 that run Windows Server 2012 R2. Server1 has the Hyper-V server role installed. 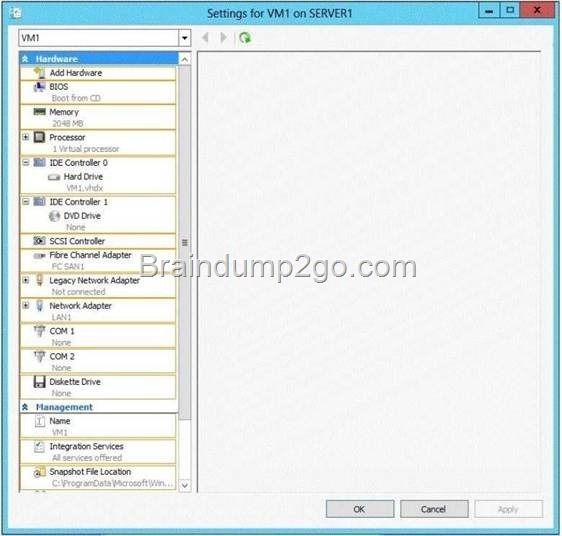 Server2 has the Windows Deployment Services server role installed. On Server1, you have a virtual machine named VM1. 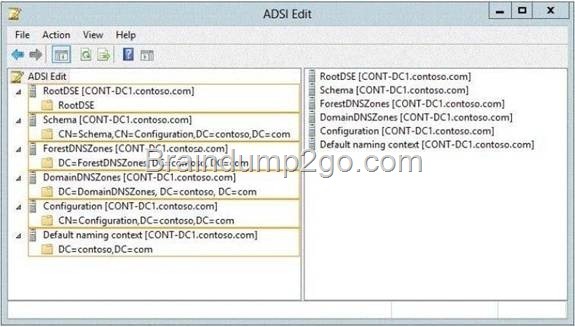 You plan to deploy an image to VM1 by using Windows Deployment Services (WDS). You need to ensure that VM1 can connect to Server1 by using PXE. Which settings should you configure on VM1? Virtual machines can be deployed to Hyper-V using Windows Deployment Services (WDS). To accomplish this requires the proper WDS infrastructure be in place and that the VM PXE boot using a Legacy Network Adapter. By default, there is only a "Standard Network Adapter" installed on the Virtual Machine, but for PXE functionality you will need to add a "Legacy Network Adapter". Go to the "Legacy Network Adapter" that you just added and specify that it should use the Virtual Switch that you just created. Last but not least, you should change the BIOS boot priority to make sure that the Virtual Machine always tries to boot first using the "Legacy Network Adapter". Just select the "Legacy Network Adapter" and move it to the top using the buttons. The DHCP option 60, when set to "PXEClient" is used only to instruct the PXE clients to try to use a PXE Service bound on UDP port 4011. Actually, if there is a bootp or dhcp service bound on UDP port 67 of an host (usually called a server), a PXE service cannot bind on that port on that host. Since the PXE Service uses BOOTP/DHCP packets to send the options 66 and 67 to the clients, it needs to be able to bind to the associated port (bootps) or to an alternated port (4011) that the clients know they must use as the alternate port. 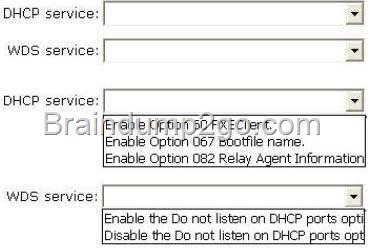 And to instruct the clients to use this alternate port, you have to set dhcp option 60 to "PXEClient". HKEY_LOCAL_MACHINESYSTEMCurrentControlSetServicesWDSServerParameters UseDhcpPorts to 0. Adds the option 60 PXEClient tag to all of your DHCP scopes. 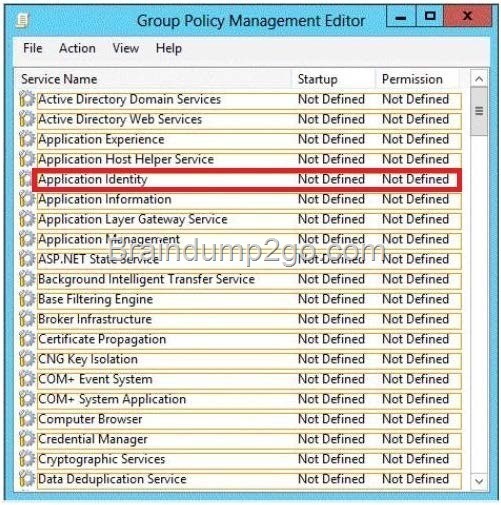 Yes, AppLocker uses the Application Identity service (AppIDSvc) for rule enforcement. For AppLocker rules to be enforced, this service must be set to start automatically in the GPO. Adds access rights for specified standard users to the rootcimv2 namespace on the local server (for access to role and feature inventory information). If you are installing an operating system on the physical disk and it is in an Online state before the virtualmachine is started, the virtual machine will fail to start. You must store the virtual machine configuration file inan alternate location because the physical disk is used by the operating system installation. For example,locate the configuration file on another internal drive on the server running Hyper-V.